The cornerstone of the Fathers in the Field Ministry is the monthly Journey Talks. This is the day that the Mentor Father can lovingly share and demonstrate the wisdom of an earthly father and the wisdom of the Heavenly Father. For many boys, this will be the first time an adult male will share something of value with this young boy. For the first time, he will hear words of the Heavenly Father and how much the abandoned boy is loved; that he was created for a purpose; that his Heavenly Father has a plan for his life, and that he is loved beyond measure and that his Heavenly Father will never, ever abandoned him. It will be the first time many will have opened and read from God’s word. In the Fathers in the Field Welcome Package, there is a full color printed Journey Guide that includes the Journey Life curriculum, a planning outline for the annual Event Celebration Event and an area to record each month’s Service project and Journey Gift. The Mentor Father should give this Journey Guide to his Field Buddy, prior to his first Journey Talk meeting so that the Field Buddy can prepare and complete the first monthly lesson in advance. The Life Journey curriculum lessons are arranged in a copyrighted four compass point manner – titled the Fathers in the Field Compass. HELPFUL HINTS Year one Life Journey Curriculum is based on the Lord’s Prayer. For many boys this is the first time hearing that there is Father in heaven that loves them, and the first time to share God’s truth with an adult male. An example… Food for the Journey, corresponds to “our daily bread” in the Lord’s Prayer. Since each annual Journey Celebration Event is going to vary, the Journey Guide provides an outline of the planning process in teaching and preparing for this outdoor adventure. The concept is that the Mentor father will share, teach and prepare – in some building block type method – up until the departure for the end of year Celebration Event. The full color Journey Guide for the Field Buddy is published separately and contains ten (10) lessons of Journey Talks. Journey gifts are provided as part of the program each month as the Field Buddy “completes” his Journey Talk lesson. These gifts are designed to help equip the Field Buddy for the outdoor adventure that will occur at the completion of their year long journey with you. These monthly Journey Gifts play a special part in helping build your relationship with your Field Buddy. Please take time to fully understand this step and utilize it in the method intended. Something very emotionally powerful happens when a man gives a gift to Field Buddy for a job well done. The monthly Journey Gift provides an incentive for the Field Buddy to complete his monthly Journey lesson. The monthly Journey Gift teaches the Field Buddy accountability; if he does not complete his monthly Journey lesson, the gift is withheld until he does. The Journey Gifts allow the Field Buddy to participate in the Annual Outdoor Celebration Event in safety and comfort. The Journey Gifts help to relieve any financial burden or embarrassment for the single mom who, in all likelihood, could not afford to outfit her son for the Annual Celebration Event. 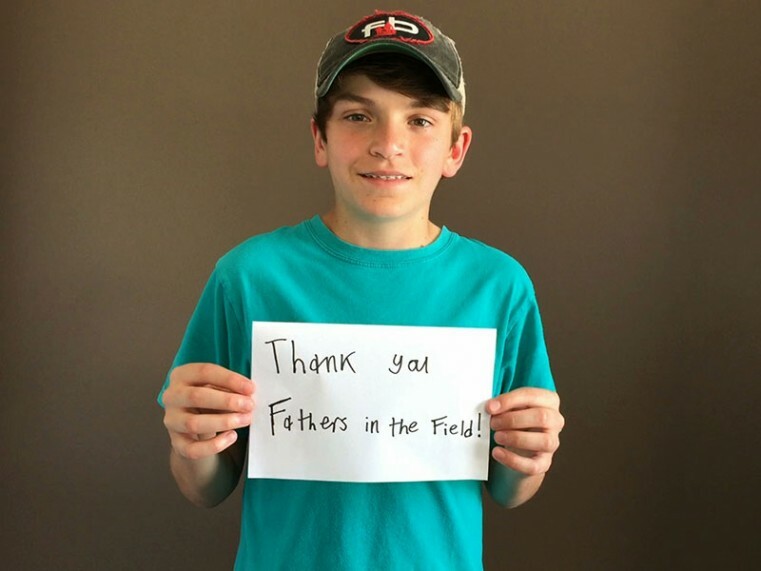 The gifts help relieve any further burden on the Mentor Father in having to pay for outdoor clothing and equipment needs for his Field Buddy. The church family shares in this ministry through their financial contribution. These earthly gifts represent to the abandoned boy the spiritual reality of our Heavenly Father’s gifts to His children. These ten (10) Journey gifts are provided as part of the program and are distributed by the Church Mentor Champion to the Mentor Father. Please see him prior to your Journey Talks with your Field Buddy to pick up your supply of Journey gifts. HELPFUL HINTS Building memories with a male role model fills an important gap in the lives of most abandoned boys. Very few abandoned boys have memories of doing something fun with a significant male. That is why we provide in the Welcome Package a Journey Photo Album so that the Mentor Father can take photos of their activities together throughout the year. He then prints them off and presents them to the Field Buddy as a reminder of the meaningful and fun times that they have had together. Please know, these pictures may have to last them a life-time. Please take the time to take pictures throughout your journey together. This is so important to the growth and memories of this young boy. It may be the only pictures he has of a caring adult male in his life. These will be a treasure beyond measure to your Field Buddy.